Right now, just a few miles from where you are sitting, someone is searching for dental services. And in 60 seconds, someone else will. Dental SEO can tap that river. One of the most accurate ways to tell how much Google search is occuring is when you are running paid Google advertising. Right now, in just an 8 mile radius of a San Antonio dental practice, there are 1400 dental related searches every day. That’s One Search Every Minute. I see it on my dashboard every day. Think about that. How many new patients a month do you need for practice to take off? Would sixty do it? Month after month after month? The fact is that having a high ranking dental website means tapping directly into a huge pool of organic search. In the time it takes for you to read this page of information, four or five people living just a few miles from where you are sitting will have searched for a dentist or dental services. A well done dental SEO campaign can plug you into that river of new patients. Getting Your Dental Website to Number One! This graph is the reason that it is so important to go all the way. 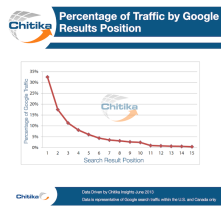 This article from Search Engine Land explains that 33% of all traffic goes to the number one result on the page. Then 17% for the number two position and 11% for the number three. 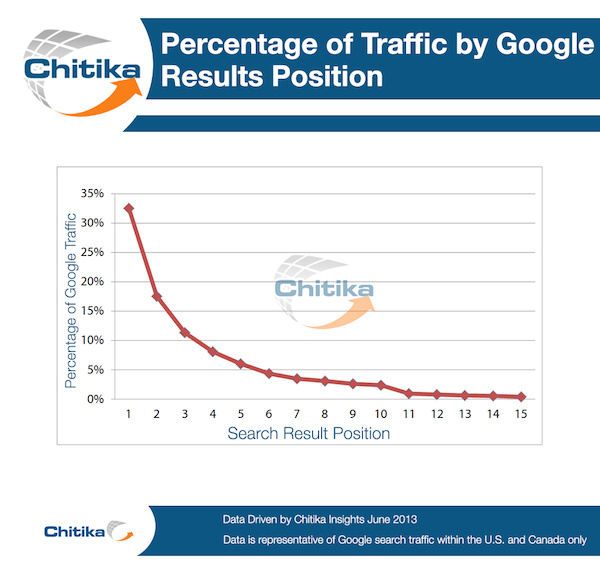 That means 61% of all search traffic goes to the top three results. But this also means that you see only very slow increases in traffic until you get to the top and then you get a sudden rush. It is important not to get discouraged. Dental SEO is NOT advertising. You do not pay a fee and start seeing visitors overnight. It can take weeks or even months. But once you are in the top rankings, there is a tendancy for a website to be able to hold a high rank with relatively minor maintenance. So it can be a hard slog to the top. But once you are there, it can stay sweet for a long, long time. Cost for a dental SEO campaign is proportional to the size of your marketing and the cost of the item you are trying to rank for. As a simple example, a full mouth reconsutrction is more expensive than a crown. Thus it costs more to SEO for “full mouth recontruction” than for “dental crown”. Also the size of the area makes a huge difference. The greater San Antonio Metro area is over two million people and it is 50 times larger than San Marcos which has a population of only 44,000. So “San Antonio Dentist” is going to be about 50 times harder than “San Marcos Dentist” . Of course at the extreme end of the spectrum we have done cosmetic dentists and other SEO clients in big metro areas who wanted to be number one for very competitive terms and in those situations monthly fees of $1500 a month are needed to make impact. So higher fees spread over 12 months are not uncommon in very competitive markets for high end services such as cosmetic dentistry services. This kind of competitiveness is worthwhile if you are offering expensive procedures. Because the rewards are high, you are competing against other practices that are taking dental SEO extremely seriously and spending the same or even higher amounts. Your dental SEO strategy must fit the size of your market, the competitiveness of the market and the cost value of the service you are offering. These factors then also determine how much your outlay will be for SEO.